What is Christianity really all about? Is it-in its essence-about proper religious rituals, or correct religious beliefs, or acceptable moral behavior? What is at the heart of an authentic Christian faith and life? In From Resurrection to New Creation Michael Pahl provides an introduction to Christian theology which attempts to answer these questions, proposing that the heart of Christianity is not a set of rituals or beliefs or behaviors, but an event-the resurrection of the crucified Jesus from the dead-that prompts a story-the gospel or ""good news"" of salvation through Jesus. Jesus' resurrection, Pahl claims, is the starting place and the compass in the journey of Christian theology, our journey to understand God, God's work in the world, and how we should live out God's purposes for humanity. Thus, beginning with Jesus' resurrection and using this event as a guide, Pahl surveys the terrain of classic Christian belief and practice. The Trinity, the identity of Jesus, the work of the Holy Spirit, the nature of humanity, Christ's atonement for sin, salvation and the gospel, baptism and the Eucharist, the church and the future state-all these landscapes and more are explored in this concise introductory survey of essential Christian theology. ""In this clear and compelling introduction to Christian theology, Michael Pahl explains the biblical roots and practical significance of the most important Christian convictions. He rightly directs our attention to God's resurrection of the crucified Jesus as the center of Christian faith and practice. Readers will come away both informed and inspired."" --Michael J. Gorman St. Mary's Seminary and University ""This is the way to do theology, as rooted in Story, God's own Story that emerges with yearning for resolution at the time of Jesus and which only Jesus Christ resolved. Theology has too often lost sight of this Story, but Michael Pahl's book calls us back once again to the Bible and to the earliest theologians' way of doing theology-let the gospel story be told and let that Story shape how we understand theology."" --Scot McKnight North Park University ""Michael Pahl profoundly grasps what too many Christians miss: that the death and resurrection of Jesus transforms everything. Carefully interpreting these events and their relationship to other areas of Christian faith, From Resurrection to New Creation shows us how the entire story of God, humanity, and the cosmos can only be rightly read in light of Jesus' saving work. This book is remarkable for its breadth of biblical engagement, its incisiveness of theological perception, and its lucid and accessible prose. 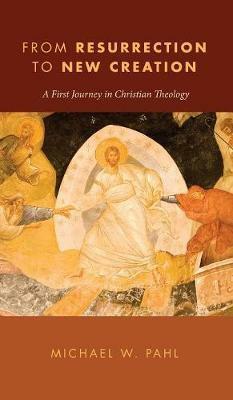 Those taking a first journey in Christian theology could ask for no better guide."" --Daniel Kirk Fuller Theological Seminary ""A splendid little book that explores the essentials of Christian theology in a fresh, lively, and insightful manner. By beginning with the resurrection, Pahl is able to make a point about both the center of Christian theology and how to do theology in a way that takes seriously the New Testament's historical context. Highly recommended!"" --David M. Miller Briercrest College Michael W. Pahl (PhD Theology, Birmingham, UK) is Pastor at Lendrum Mennonite Brethren Church in Edmonton, Alberta, Canada. He has taught biblical studies and theology for over ten years in college and seminary settings in Canada and the UK, and he is the author of Discerning the 'Word of the Lord' (2009) and co-editor of The Sacred Text (2010).